It´s just one word needed to point out the necessity of having a proper fixed VHF radio in your yacht: Safety. Being able to communicate with other ships or coastal radio stations is an absolute must for the sailing yacht – even if one is sailing just in the vicinity of the shoreline. Some weeks ago I finally decided to sell the old Elna RT 2014 “Sailor”. Not because it was old nor was it because it wuldn´t function properly: It was due to the fact that modern VHF radios just have so much more safety features. 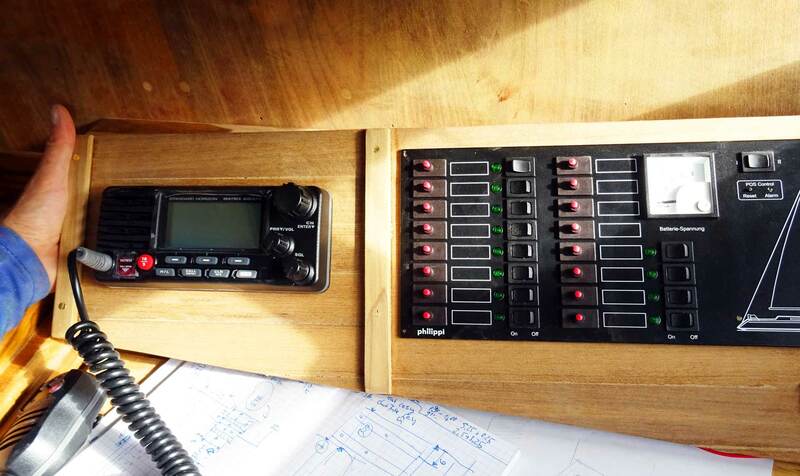 The new radio that is going to be installed on SY OLIVIA, that´s for sure, should incorporate the latest technology safetywise. And I think I´ve made the right decision: Meet the all new Standard Horizon Matrix GX 2200 E fixed radio. Since I acquired my SRC certification (read the full article on the Short Radio Certificate here) I am convinced that especially within shoreline reach of let´s say up to 15 miles the DSC-functionality is the best you could have. DSC (Digital Selective Calling) allows you to press just one single button in case of a distress: The radio will automatically and repeatedly send a digital message comprised of ship´s name, call sign and other data, the current position and the kind of distress. The Standard Horizon Matrix GX 2200 E of course has this Class D DSC transmitter and that´s a real plus for safety. On the other hand, DSC allows the sailor to reach out to certain, selective ships within VHF-reach and to call them digitally by their MMSI. This is also a very nice feature that helps you to get in touch with someone specifically without the need to plug up the channels by voice radio. I am a strong advocate for no frills sailing. And therefore I disapprove any unnecessary energy-consuming appliances aboard, such as too big fridges (read the article on galley-refit here). But when I was really experiencing which advantages AIS (Automatic Identification System) bears for the sailor, I couldn´t think of rejecting this fascinating technology. AIS means to have access to static (ship´s name, MMSI, length etc.) and dynamic (ship´s course, speed etc.) data of the surrounding ships. Again, that´s a huge plus for safety: And I rather haven´t got to think of mist and fog in this matter. 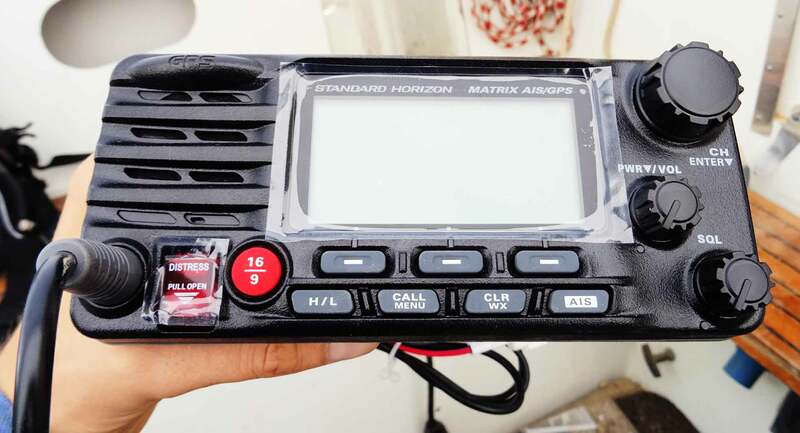 Again, the small Sandard Horizon fixed radio features an integrated AIS- as well as a GPS-receiver. That means that I am now able to read those information off the 1.8 inch display sitting at my chart table. Via NMEA-interface those informations could be sent to a chart plotter which is a great, great plus for navigational tasks when under sails. AIS-functionalities also comprise the CPA-alert: When the closest point of approach is programmed, the Standard Horizon radio will set off an alarm warning of a potential collision. Of course, this radio “can” voice radio too. The best thing is, I don´t have to send the equipment to and official to have MMSI programmed. That´s perfectly possible to program the radio by oneself. 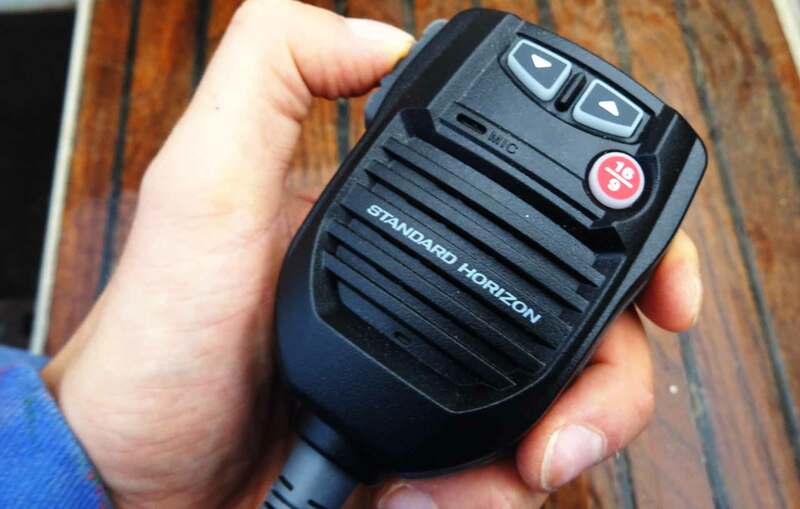 Regarding VHF voice radio procedures, the compact radio also features a 30 Watt speaker, a handy mic with separated CH 16 as well as up- and down-switches. The whole station is waterproof according to IPx7 (safe against temporary immersion). I love the fact that despite my chart plotter I now have a redundant system regarding GPS-data and navigational tasks. The integrated GPS-features on this very radio enable me to save up to 100 waypoints making navigation easier. Again, the GX 2200 E is far beyond an ordinary VHF-radio. Of course, to complete the possibilities which AIS offers, I´d rather need an extra AIS-transmitting device which I am going to acquire next. Why did I go for the Standard Horizon model? It first and above all simply meets all the standards of modern day VHF-communication. Furthermore, this piece of equipment offers far more than that: AIS/GPS isn´t standard on most of the VHF-radios currently available. But the best thing about the Standard Horizon Matrix is … the price: The very attractive price of just around 400 Euros is tempting and finally convinced me to opt for Standard Horizon. Sometimes it´s even less, it´s worth checking the offers. In Germany, SVB is the authorized dealer, for more information check the Standard Horizon-website. 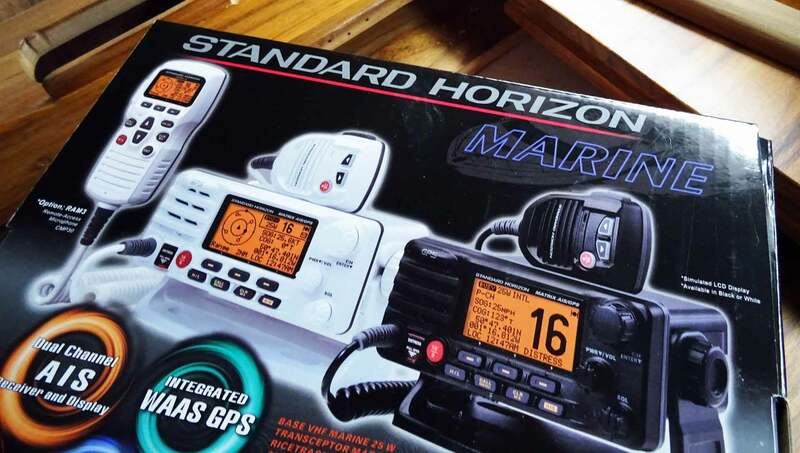 With the Matrix GX 2200 E I get a high tech VHF radio full of fascinating surplus functionalities and now have the possibility to connect it via NMEA to other gadgetry in my yacht. Why pay double the price for less functionalities? It´s just perfect. I can´t wait to have the radio installed to the yacht and finally set sail. Now, in having acquired the Matrix VHF it´s just a handful of equipment I need in order to have the yacht´s stack completed. Thanks for the review of this unit. It’ s on my Xmas list.